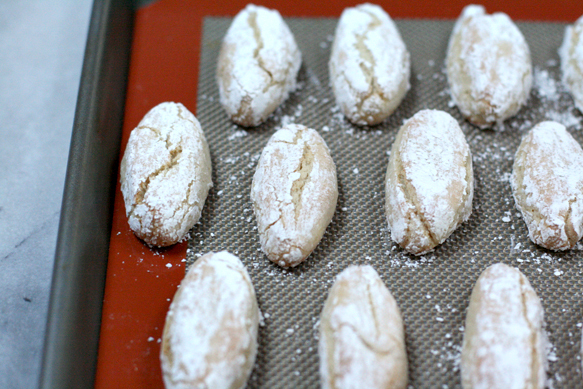 The first time I tasted Sienese almond cookies was in Tuscany, in fact not too far from Siena. My husband Marc and I were vacationing at Borgo Pretale, an enchanting hotel tucked away in luscious green hills, surrounded by lavender, vineyards and sunflower fields — the quintessential Tuscan destination! We were relaxing on the terrace after a memorable meal when the staff brought us a glass of sinfully-delicious Vin Santo and Sienese almond cookies to nibble on. I still remember the first bite — an intense almond flavor exploded in my mouth. I swooned! Needless to say, I brought several bags of those delicious treats home, but when they ran out I set about creating my own recipe. These dainty and flavorful cookies have since become a household favorite, especially around the holidays when we are more prone to indulge in a glass of dessert wine — and a cookie — while relaxing in front of a warm fire. 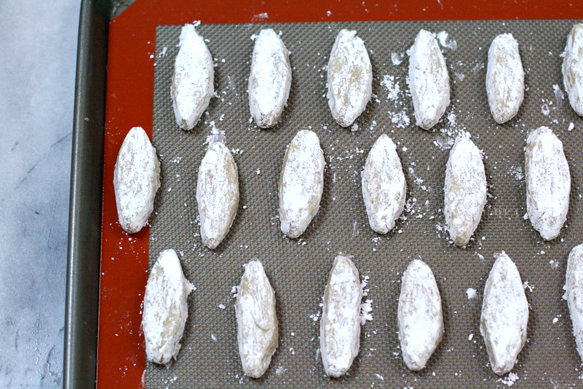 But that’s not the only occasion for which I make these Sienese cookies. Invariably I find myself baking batches of them to give as holiday gifts, along with gorgeous bottles of herb-infused honeys. On a practical note, since I bake many desserts during the holidays (my pumpkin crème brûlée with ginger, for example), I end up with lots of leftover egg whites. Since I wouldn’t dream of throwing them away (or worse, making egg-white omelets!) I always save them to make these treasured cookies. 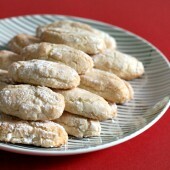 Of course, these cookies are perfect with a glass of luscious Vin Santo from Tuscany. But you could also serve equally delightful dessert wines, such as a Vinsanto from Santorini (Greece) or a Tokaji from Tokaj (Hungary). 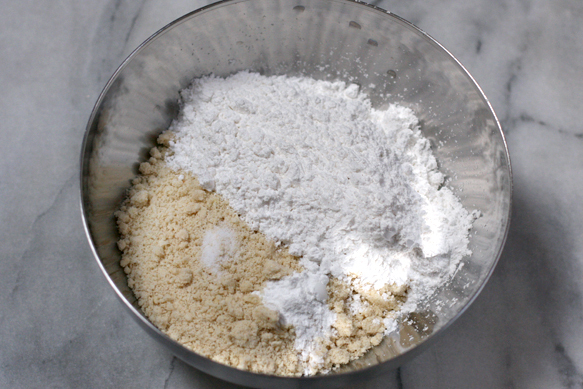 Step 1: Place the almond meal/flour, flour, sugar, baking powder and salt in a medium bowl. Stir until well blended. 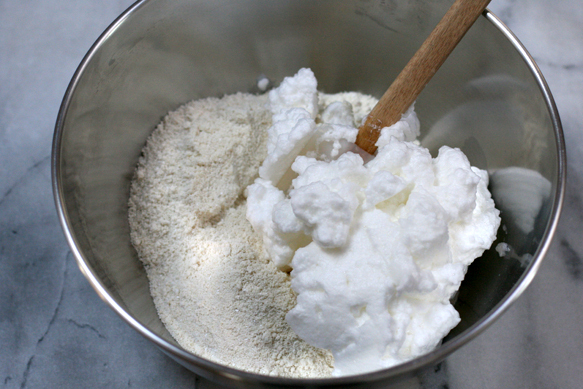 Step 2: Place the egg whites and almond extract in the bowl of an electric mixer. Whip at high speed until firm peaks form. Step 3: Add the whipped egg whites to the almond mixture and stir with a silicone spatula until the dough just comes together. Do not overmix or the cookies will be heavy. The dough will be soft and a bit sticky. Step 4: Sprinkle the powdered sugar on a work surface and on your fingers. Using a teaspoon grab a bit of the dough (about the size of a large olive). Drop the small mound of dough in the powdered sugar and roll it around until well covered with the powdered sugar. Shape into a 2” x 1/2” lozenge and gently flatten the top with the tips of your fingers. Place on a jellyroll pan lined with parchment paper or a Silpat. Repeat until you have shaped 24 lozenges. Bake 10 to 12 minutes until the cookies have risen and are pale-golden. Step 5: Remove from oven and let cool for 2 or 3 minutes. Transfer to a cooling rack and let cool until room temperature. Store in an airtight container for up to 2 weeks. Cook’s note: I purchase the almond meal/flour for this recipe from Bob’s Red Mill. 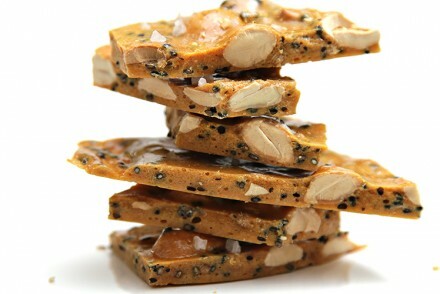 However, you can make your own by finely grounding the almonds in a food processor. 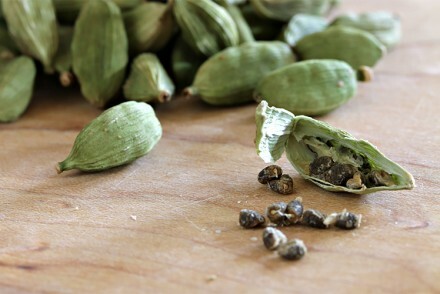 Use blanched almonds and a little bit of flour (1 tablespoon of flour for every cup of almonds: this will prevent the almonds from turning into almond butter!). Process until very finely ground. It is hard to get the almonds as finely ground as the commercial almond meal/flour but it will still be adequate for the recipe. If grounding your own almonds, omit the 2 tablespoons of flour called for in the recipe. The cookies will stay fresh only for up to two weeks, so I recommend not making them too far ahead of time. Once the bag is open, though, you can be sure they’ll disappear in the blink of an eye! 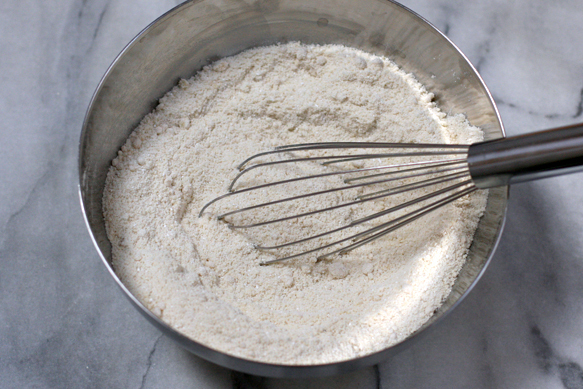 Place the almond meal/flour, flour, sugar, baking powder and salt in a medium bowl. 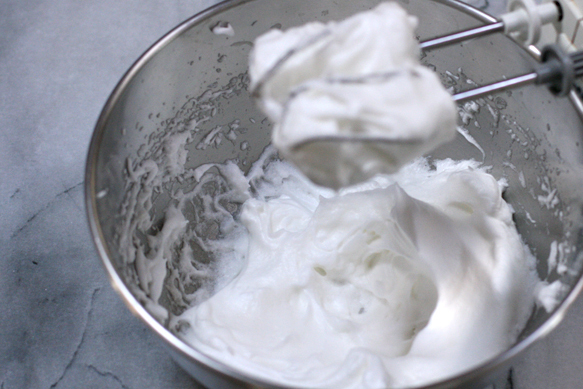 Place the egg whites and almond extract in the bowl of an electric mixer. Whip at high speed until firm peaks form. Add the whipped egg whites to the almond mixture. 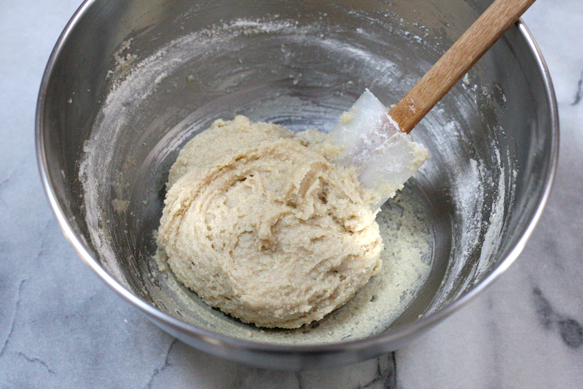 Stir with a silicone spatula until the dough just comes together. Do not overmix or the cookies will be heavy. The dough will be soft and a bit sticky. Sprinkle the powdered sugar on a work surface and on your fingers (this will help with the sticky dough!). Using a teaspoon grab a bit of the dough, about the size of a large olive. 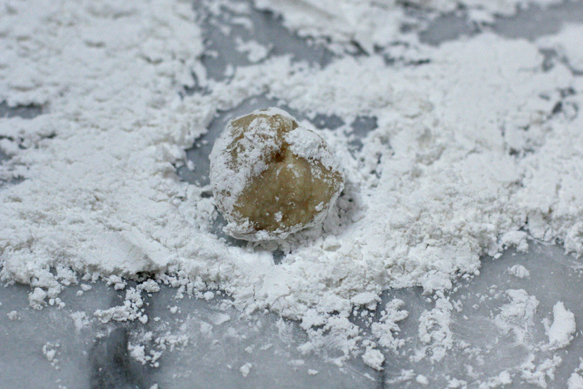 Drop the small mound of dough in the powdered sugar and roll it around until well covered with the powdered sugar. Shape into a 2″ x 1/2″ lozenge and gently flatten the top with the tips of your fingers. Place on a jelly roll pan lined with parchment paper or a Silpat. Repeat until you have shaped 24 lozenges. Bake 10 to 12 minutes until the cookies have risen and are pale-golden. Remove from oven and let cool for 2 or 3 minutes. Transfer to a cooling rack and let cool to room temperature. Viviane, I’m going to make these tomorrow or Tuesday. 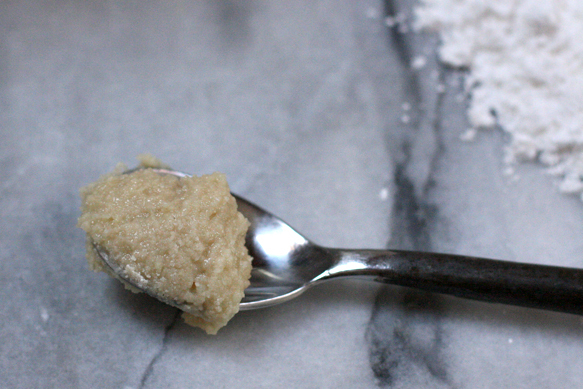 I picked up some almond flour the other day, vaguely aware that I had wanted it for something — but what? Now I remember! We got these in Siena last February, and they’re wonderful. I remember them from Borgo Pretale, which isn’t surprising, as the ones we bought in Siena were made in Sovicelle! 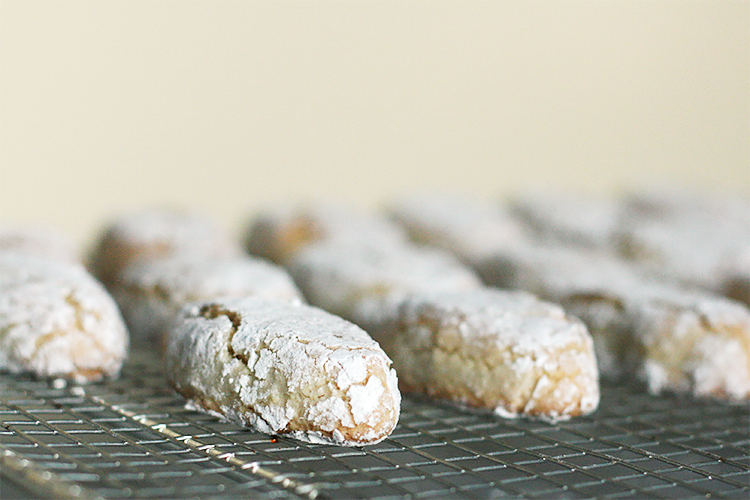 Wonderful cookies and they are even better with a glass ( or 2 ) of dessert wine. I roll them in sifted powdered sugar once again before serving. Thanks so much for the recipe. Wonderful website. Would love to be able to download a particular recipe without all the readers commments. No print feature available. Gisela, Thank you so much for stopping by and for your comment. I am so, so happy that you enjoyed the website. 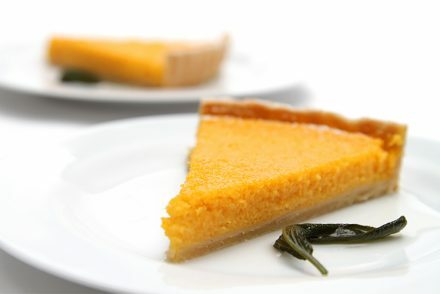 We’re working on the print feature for all the recipes on the site and should have this available for all of them by the end of June 2011. I’ll notify you when we’re up and running with it. Thank you again and happy cooking! Hello Vivane! These cookies remind me somewhat of the Greek cookies made with ground almonds (or other nuts) called kourambiedes, which are to die for. After you cook them you cover them with powdered sugar and then basically pack them in a box with powdered sugar. (You are getting the idea here.) During the month of December, Greeks offer mounds of these cookies at their home, at their shops, even at gas stations…everywhere!!! Although I don’t have a major sweet tooth I find them IRRESISTABLE. In fact, I cannot have them in house while I am alone… 😉 Looking forward to trying this Italian counterpart! Thank you, once again! it looks very good .I love almonds.I am going to try. These cookies look yummy. Must give it a try. Oh my goodness! Looks wonderful and I was swept away in my imagination with your story. I would love to visit those places. I must try these… looks so easy! Thankyou! I have been using a recipe for pinched orange macaroons from the Four Seasons pastry chef in NYC via marthastewart’s show and posted on my blog. 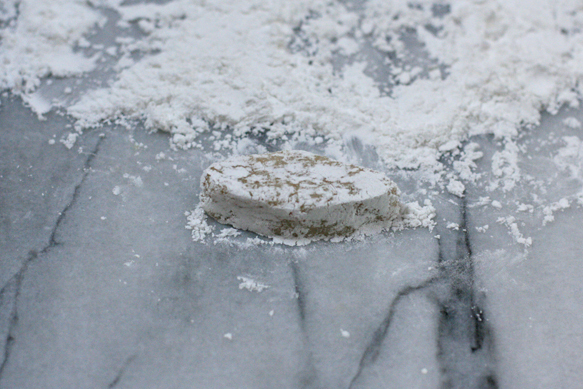 The almond paste is expensive, but everyone loves them – so I would like to try this recipe which calls for almond flour – and compare taste. I enjoy your cooking videos! I love nuts in cookies very sure I am gonna love this. They look heavenly. I hope to find some almond flour. They are always hard to find. But we do have some whole almonds. I think I would finish them before sharing it with someone. Defintely something I need now to pick me up. Stressful work day. Thes look delicious, now I wish I still had some Vin Santo left…. first,congrats for today top 9!second:it’s a wonderful post ,with delicious cookies! It’s been a long time I wanted to post you a comment as I love very much your blog ! Yesterday I spent a long time to write you about the post on honey but at the very last time my computer bugged !! I cursed it ! anyway today it is back so I hurry ; in a shortcut i was just saying that your idea of gift with different honeys was great and i may use it for oils in small bottle with different flavours ..why not ,!!! I am an amateur cook and i have created my blog just for fun so if you like inventive french food have a visit to my blog you and your readers are most welcome !!! recipes are now in english! I’ve had similar cookies, and oh, they are so wonderful! I am definitely bookmarking this recipe. I’ll convert it to gluten-free, which shouldn’t be too difficult, as there’s only a bit of flour in them anyway. Yum! Can’t wait! What I would give to be on the terrace in Italy right now! These cookies look phenomenal…definitely on the to-do list for Christmas. Have a wonderful Thanksgiving! These cookies look like fun! I can’t wait to taste them and share them with my family. We want to bake some special treats as gifts to dial back the holiday gift insanity. These will be perfect. Thank you! And as always, love your photos and writing. These are very lovely! And I just happen to have some almond flour on hand, too.